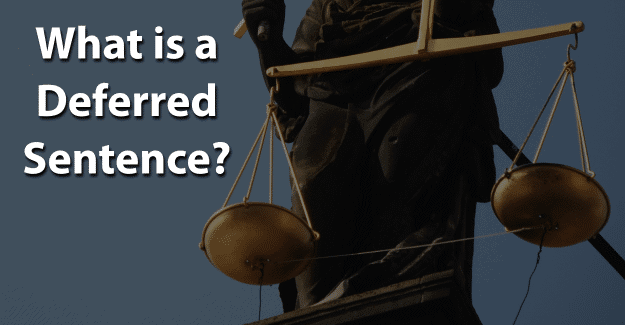 This blog post will address the question of what a deferred sentence is. Will a Deferred Sentence Show Up On a Background Check? After a person is charged with a crime, the prosecution and defense prepare the case. Then, the trial takes place in a court of law. At the conclusion of the trial, the judge hands down a sentence if the person is convicted of the offense. The sentence is required to follow basic criminal sentencing guidelines established through the constitution. A deferred sentence is a sentence that is suspended until a defendant has completed a probationary time. If the conditions of the probation are met, the sentence may be thrown out in court along with the guilty plea, clearing a defendant’s record. Under a deferred sentence, the court postpones sentencing until the end of the deferral period. A defendant must plead guilty or “no contest” to a crime in order to receive a deferred sentence, which often happens following a guilty plea as part plea bargain. A deferred sentence is often given to a first-time offender or to someone who has committed a minor crime. If these conditions are met and the case is dismissed then the defendant won’t have a criminal record and can tell employers honestly that there is no conviction. Even after the charges are dismissed following a successful probation, a public record of the arrest, charges, and court proceedings will still exist. Following the successful completion of a deferred sentence, a partial expungement will be available, which means that charge is wiped off the criminal record. For a felony, he or she will be eligible for a full expungement 10 years from the end of a deferred sentence. Following a misdemeanor, a full expungement can come after one year. After a deferred sentence is successfully completed, the case will be dismissed. A judge may then throw out the sentence and the guilty plea. At that time a civil petition must be filed to seal the criminal arrest record to keep the records of the case out of the public record. If someone violates a deferred sentence by failing to meet the terms of a probation, it will become a term of incarceration, typically the length of the original sentence. When applying for a job, an employer will view driving records, credit reports, and educational records in addition to criminal offenses. Background information helps an employer to determine a candidate’s past mistakes, character, and financial fitness. It also helps them identify hiring risks for the safety of the company. The criminal record review of a background check includes examining criminal history files for any criminal offenses, which will reveal all convictions and non-convictions, including cases not prosecuted or those dismissed. Convictions can be reported without a time limit while a non-conviction will show up for seven years. A crime will not show up on a background check if a felon has his or her record expunged. Since a deferred sentence requires a conviction before that sentence can be granted, it will show up on a background check throughout the probation period. After the probation has been completed, a deferred sentence will no longer show up on a background check. However, the original arrest and the felony charge will still be part of the record and will be revealed in a background check. A deferred sentence offers a defendant the opportunity to have a conviction dismissed upon satisfying all terms of the probation. However, the defendant must plead guilty or no contest in order to be eligible for this type of sentence. This creates a record that contains a conviction which would follow a felon until all terms have been completed. When trying to get a job, it could have an impact on the job search. A defendant may be found guilty anyway if a plea bargain containing a deferred sentence is not obtained. In any case, it is recommended to have an attorney for proper advice. One advantage of having a deferred sentence is that if the probation is completed successfully, the case will be considered dismissed. When considering dismissed cases, the burden is on the employer to gather enough information to determine if it’s reasonable to believe the individual actually committed the crime. However, many employers will not go to this length and will not consider a dismissed charge as something to be concerned about. A felon would have the best chance at getting a job by having his or her record expunged. Doing a background check on him or herself before applying at certain companies will allow a felon to know exactly what will be discovered when the potential employer does their review. A felon with any questions can contact an attorney. It’s essential to take action and not risk a chance on the results. For someone wanting to do a background check on themselves, especially when it involves a deferred sentence, there are places that can help. If it comes up, it’s best to be honest about a deferred sentence. It’s never good to lie about one’s past on an application. This could result in not being considered for a job if a company finds out about it. He or she should take responsibility for past actions and explain how he or she is putting his or her life in order. Doing his or her own background check allows a felon to know what an employer will see on his or her record. A felon needs to remember that he or she is not defined by his or her crime. We are not defined by our mistakes but in how we recover from them. He or she must be willing to see him or herself in a different light, ready to establish an honest life. The best opportunity for success in a new life begins with having support from family and friends. So, what do you think about this blog post about what a deferred sentence is? Have you or someone you know had a deferred sentence? What was that like and how did he or she deal with it? Please tell us in the comments below. I recieved a deferred sentence for a felony charge in 2012. I am a single mother with very little income because I cannot work due to several disabilities for which I’m applying for SSI. This has prevented me from staying current with my paymts resulting in collection fees, warrant fees & misc fees which have accumulated making the total more than double in the past 7 years. So initially the court set a fine of $5000 with $4500 suspended but as of today, I owe the court on that case more than $1200. My reality is that I feel I’ll never get them paid & the court will always have a tight leash on me. Is there any resources for my situation?